Arms. Azure, semee of cross crosslets, three cinquefoils, argent. Crest. On a chapeau, gules, doubled ermine, a bull passant, sable, corned, unguled, and furnished. Motto. Un Dieu, un Roy. 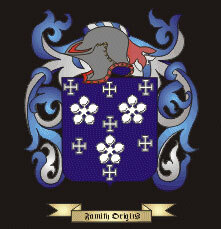 The D'Arcy family claim direct descent from a French family derived from Charlamagne, named for Castle d'Arcie near Paris. They travelled with William the Conqueror to England, and were appointed to positions in Ireland in the 14th century. They established themselves at Kiltullagh, Newforest, Gorteen and Houndswood. One of the Tribes of Galway, they are not to be confused with the Darcy families, who are of Gaelic origin. This family stands highly distinguished in the annals of the kingdom. Its descent is derived from David D'Arcy, of an eminent family in France which deduces its origin from Charlemagne, who took his surname from Castle D'Arcie, his chief seat, which lay within thirty miles of Paris. His son, Christopher, having, with a band of his vassals, joined the crusades, died in Palestine, leaving Thomas his heir, whose son, Sir Richard D'Arcy, accompanied William the Conqueror to England. From him descended, Sir John D'Arcy, who was high in repute with Edward II. by whom he was appointed justice of Ireland in 1323. He married the Lady Jane Bourke, daughter of Richard, Earl of Ulster, from which marriage are derived all the D'Arcies of Ireland. The Galway family is immediately descended from James Riveagh D'Arcy, who settled here about the end of the reign of Elizabeth, and, in consequence of his superior abilities and address, rapidly acquired considerable power and influence. From him sprung in a direct line the house of Kiltulla, and the families of Newforest, in Galway, (formerly of Clunuane in County Clare), Gorteen and Houndswood in County Mayo.